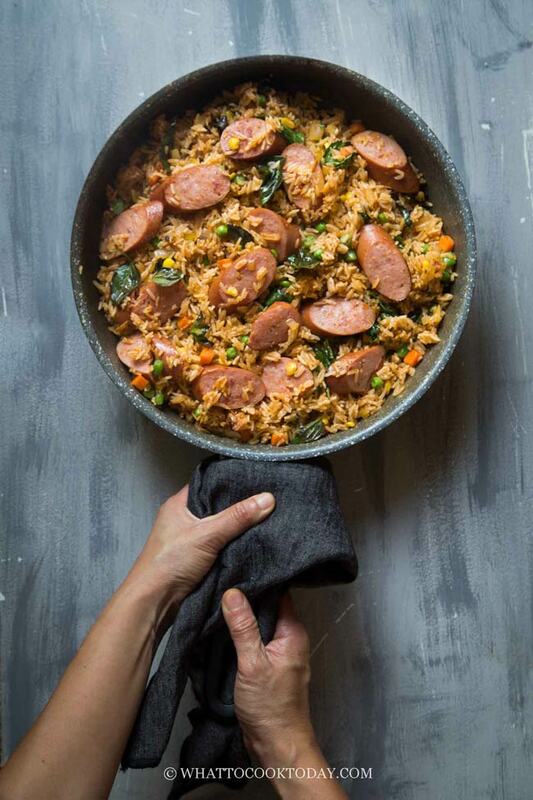 Learn how to make the best, super easy and quick Thai Red Curry Sausage Fried Rice that will quickly become your all-time favorite. This post is sponsored by Eckrich Smoked Sausage but all opinions are of my own. We have been enjoying a slow summer and lots of grilling outside so far. However, busy season is coming up with the kids going back to school soon. If you have no plan, it’s no problem! 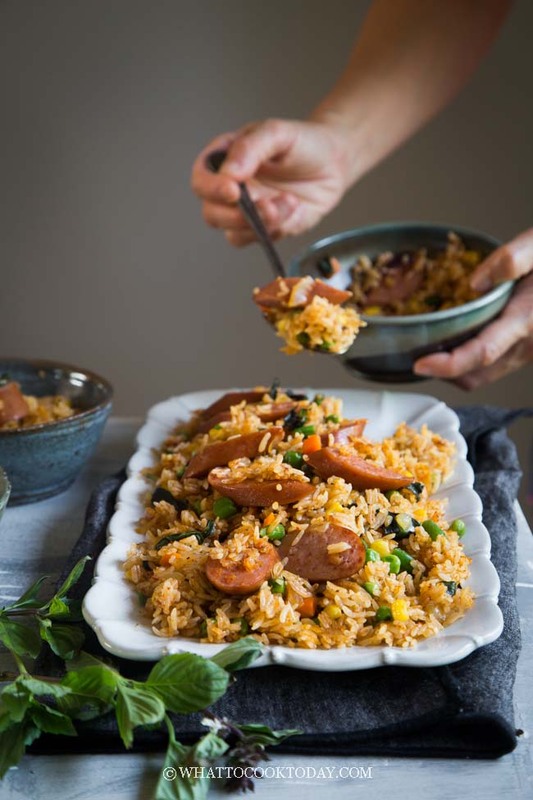 Quick and tasty recipes like this 20 Minute Thai Red Curry Sausage Fried Rice will soon come in handy. You don’t need to be a chef or feel intimidated to whip up this super easy recipe. Chances are, your homemade fried rice will taste wayyy better than the take-out. Fried rice and sausage are my two favorite things to put together. 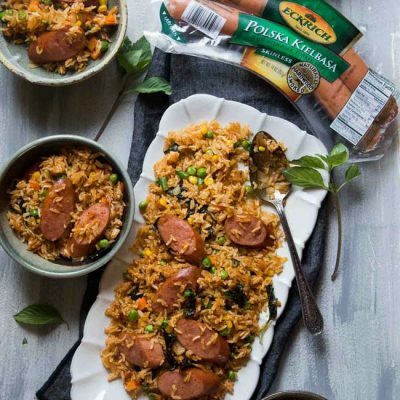 This Thai Red Curry Sausage Fried Rice features Eckrich Polska Kielbasa Skinless Smoked Sausage. You guys…this fried rice combination is totally delicious. 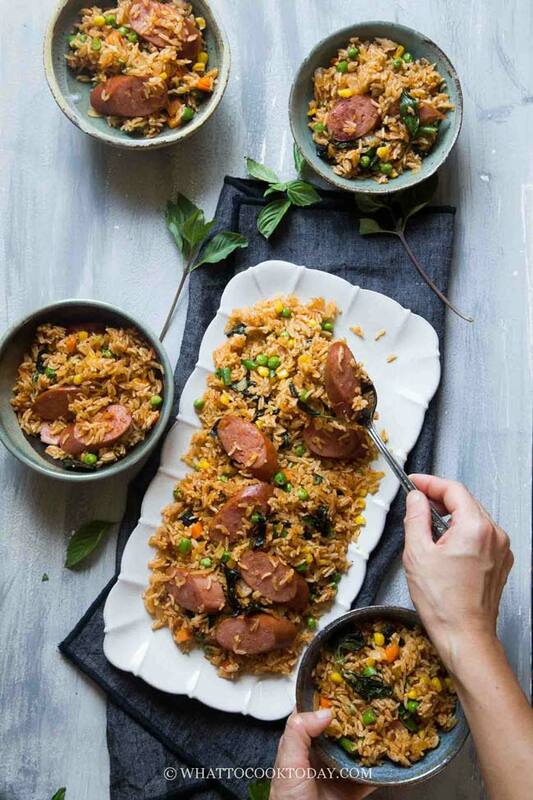 The rich and savory taste of Eckrich Smoked Sausage is so versatile it pairs well with so many ingredients, but it’s especially delicious with Thai red curry and basil leaves in the fried rice. 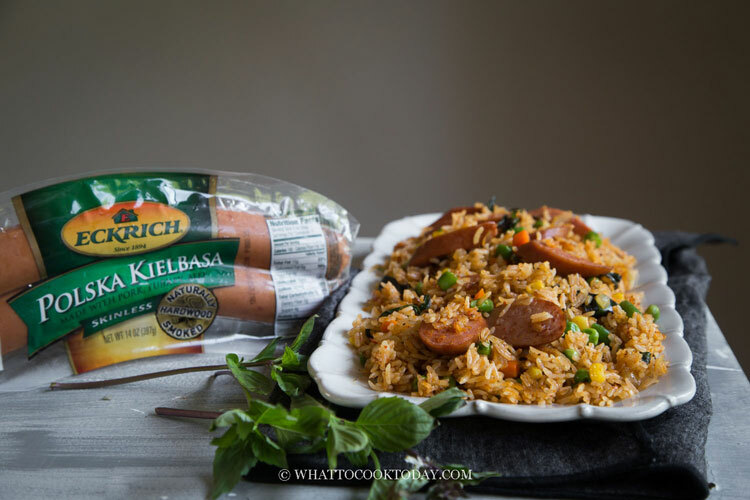 Eckrich Smoked Sausage is a perfect go-to ingredient to make a delicious and easy meal like this 20 Minute Thai Red Curry Sausage Fried Rice. It is quick to make and only one-pan needed. ONE PAN! This makes clean up a breeze and saves on time so that you can focus on back to school prep. Now, are you in yet? A day-old rice tends to be at a “dry” side, which is good for fried rice and will prevent it from clumping together when you stir fry it. Simply cook the rice the day before and chill overnight so it is ready to be made into fried rice the next day. A good stir-fry of any kind needs heat. High heat will prevent your rice from turning soggy. You will be surprised that with only a few ingredients, you can actually make a really good fried rice like this. Not all fried rice needs soy sauce. 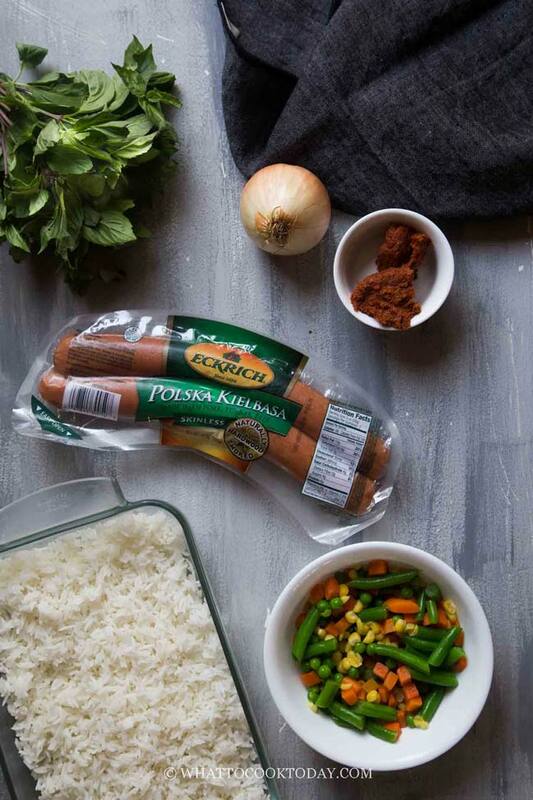 This recipe has nice, rich, savory taste from the Eckrich Smoked Sausage, Thai red curry paste and aromatic basil leaves. It is still possible to make good fried rice if you don’t have day-old rice. Sometimes I do want some fried rice but there isn’t any leftover. Warmed rice tends to clump together because they are stickier. 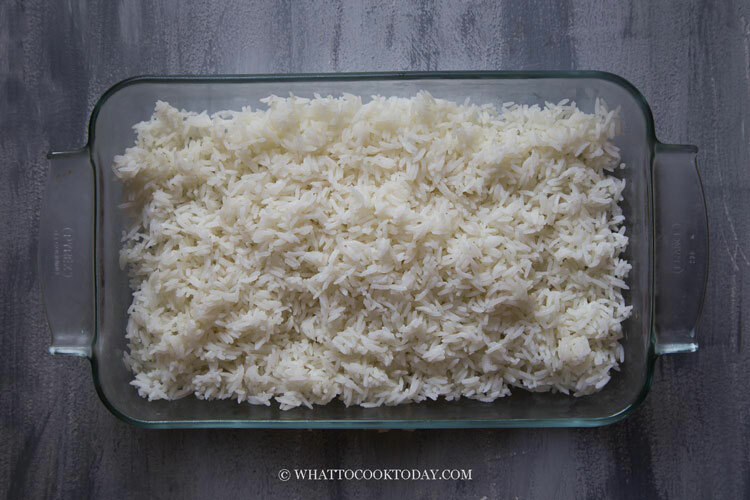 So, here’s what you can do: spread the rice on a baking sheet in one layer and pop this into the fridge to let it chill for 15 minutes or longer if you have the time. This will help! 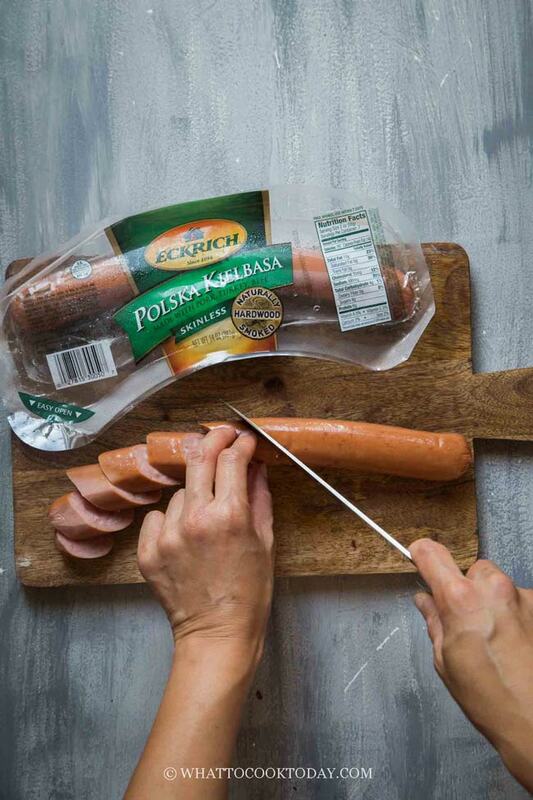 Eckrich Smoked Sausage comes in a wide variety of flavors and forms, including links and ropes and can be found in the Deli section at your local grocery store. There is always something for everyone. It’s a perfect go-to ingredient to create that delicious meal in no time. 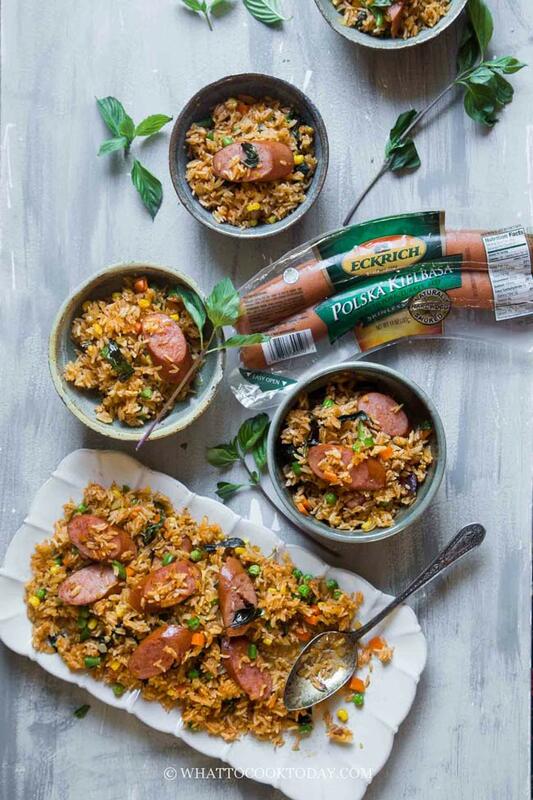 What is your favorite recipe using Eckrich Smoked Sausage? 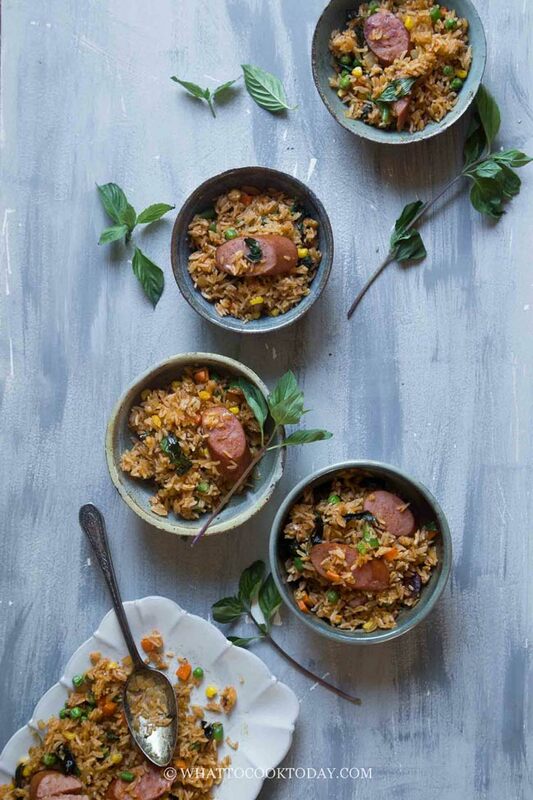 Learn how to make the best and super easy and quick Thai red curry sausage fried rice that will quickly become your all-time favorite.